Gain job search visibility now! I founded Hunter2Hunted to help you get visible and attract the tech industry's leading employers and recruiters. With more than 90% of recruiters and 80% of all employers actively seeking, verifying and recruiting professional candidates over the Internet, online visibility is now the single-most important factor in job search success. Are you an IT executive or technology professional moving up in your career? As a globally recognized IT resume expert, I have helped more than 1600 Technology Executives and upwardly-mobile IT Professionals achieve career and financial success in the highly competitive tech industry. My resumes and cover letters have won top industry awards, and my social job search knowledge, especially in the area of LinkedIn Profile optimization, will ensure that you have all the tools necessary for a smooth, simple, fast and winning job search. "This man has a winning way with words. As a writer, he wrings out value ... while packing power and punch into social media profiles, resumes, cover letters, and more. It's no surprise that he was a standout and admired thought leader by other career writers in a recent G3 (Get Clear, Get Found, Get Hired) class that I taught with Deb Dib. No surprise he's been honored with #1 TORI awards for his IT resumes. No surprise that I chose him among a handful of the country's best writers to include his samples in my bestselling resume book Resume Magic!" I develop interview-winning resumes, cover letters, LinkedIn Profiles and bios for $100k-$500k senior executives. I specialize in interviewing, coaching and working with C-suite and VP-level IT executives at Fortune 500s, startups and high-growth companies. I partnered with senior executives, entrepreneurs, venture capitalists and startups to develop resumes, cover letters, social media presence and strategic career marketing documents that captured attention and resonated with target audiences. Reviewed and analyzed existing resumes, developed strategies to position clients as captains of industry, captured and built messages that resonated with personal brand and helped to ensure that clients achieved their career goals. "I am constantly amazed by Kevin's writing and strategic skills. He has an innate ability to ask job seekers questions that help them discover the value they bring to the table. He uses that information to develop and effective strategy to market their value and produces well-written, hard-hitting resumes that sell our clients ... and as a bonus they enter their job search with a tremendous boost of confidence. I've been in this business for more than two decades and can honestly say he is one of the best writers out there!" I provided senior-level resume writing services managing up to 250 projects per year. I was elected chief executive of this national non-profit organization in 2006 and served the needs and interests of nearly 400 professional resume writers and career coaches. I also served as 2nd Vice President (2008) and on the NRWA’s Certification Committee (2007 to 2009) helping to ensure that the NCRW certification remained the gold standard of professional resume writer certifications. I can build your online presence with minimal effort from you. An active member of The LinkedIn Profile Writers Directory, I completed The FAVAR™ Method of LinkedIn Profile Creation and can optimize your Profile for the way recruiters search LinkedIn. I have partnered with 1600+ IT executives and professionals to deliver game-changing resumes that shorten the job search cycle. 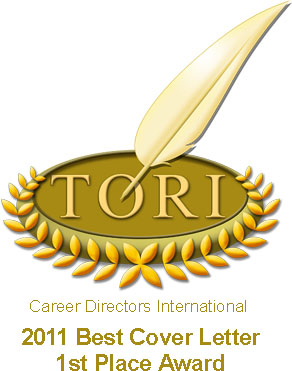 I won the industry's top international award for cover letter writing in the two years I entered. My cover letters are succinct, compelling and squarely focused on your ability to bring value to your next employer.